Kombucha Hangover Cure: Is Fermented Tea Good Or Bad For Veisalgia? Kombucha For Hangover: Is Fermented Tea Good For Veisalgia? There are numerous hangover remedies relieving the heavy morning after drinking symptoms. Kombucha hangover cure is often a recommendation, but there is limited data to support such claims. Some have suggested that this drink can provide improvements in hydration and assist in replenishing electrolytes that can be helpful for symptoms associated with a hangover. In this post, consider the benefits of kombucha for the hangover and see if this is just another myth that holds no real results. How can kombucha help a hangover? What are the possible risks of treating veisalgia with fermented tea? Is kombucha effective in hangover treatment? Kombucha is a fermented drink that combines a sweetened tea, often in the form of green tea or black tea, with what is known as a SCOBY. SCOBY is an abbreviation for what the product is – a symbiotic culture of bacteria and yeast. Some yeast and bacteria strains are added to the SCOBY and then used to ferment the black or green tea used as the base of the kombucha drink. This is a fizzy type of fermented drink that is considered slightly alcoholic, but usually not enough to cause drunkenness. There are different flavors of this fermented drink available on the market. How Will Kombucha Help A Hangover? Kombucha has many possible benefits regarding a person’s well-being. For those looking to find an answer to how to cure a hangover, the SCOBY-drink may assist in alleviating some of the potential adverse effects that might be caused by the alcohol that the person consumed the previous night. Consider the possible health effects and benefits that could make kombucha and hangover a good combination – to reduce the symptoms of the hangover, of course. When it comes to looking at kombucha benefits for the hangover, one of the first things that should be noted is the fact that the drink has many essential vitamins and minerals. Adding some flavors to this fermented tea can increase the effect. For example, watermelon kombucha can cure hangover cure even better due to the additional vitamins from watermelon juice. Kombucha contains folate, vitamin B2, vitamin B6, vitamin B1, vitamin B3, and vitamin B12. Additionally, this drink contains probiotics. The vitamins and minerals can replenish lost nutrients caused by the consumed alcohol, while the probiotics can help to balance gut flora, damaged with excessive alcohol usage. When looking at ginger kombucha for the hangover, the ginger content in the drink may help to calm the stomach. Nausea is quite common and also considered among the typical signs of a hangover. One study found that nausea caused by many different issues can be effectively alleviated with the use of ginger – the results were also more significant compared to the placebo group. When using kombucha tea for a hangover, nausea can be alleviated even in cases where ginger is not an added ingredient. The fermented tea product may also help to reduce stomach pain and an upset digestive system. Watermelon cucumber kombucha for a hangover may assist in detoxifying the body. Alcohol causes the buildup of toxins in the body, including acetaldehyde. Nitrogen species, reactive oxygen, and some other adverse effects occur. It is a fermented beverage and is high in a compound known as glucuronic acid, which helps to increase the level of glucuronidation in the body – this is a detoxification process in the human body. 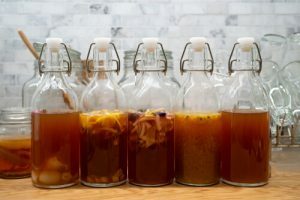 The probiotic value of kombucha further helps to improve gut flora and helps toxins and other harmful substances, including the acetaldehyde, move out of the body faster. Dehydration is one of the most concerning effects of alcohol use and can also deplete levels of electrolytes in the patient’s body. This is another area where kombucha might come into play. Re-hydrating the body is often one of the first recommendations a person would find. Kombucha contains a large number of electrolytes – these are compounds that the body requires to stay functioning and hydrated. The fluid content in this beverage also contributes to improved hydration. Kombucha is sometimes used to assist in stimulating a patient’s appetite as well. While this is sometimes considered a potential side effect associated with this fermented tea, for those with a hangover, the increase in appetite can help to replenish vitamins and fill the stomach preventing the digestive system adverse reactions. For those wondering what to eat for a hangover, the light snacks like crackers or toasts with green vegetables and chicken breast might be the best option. 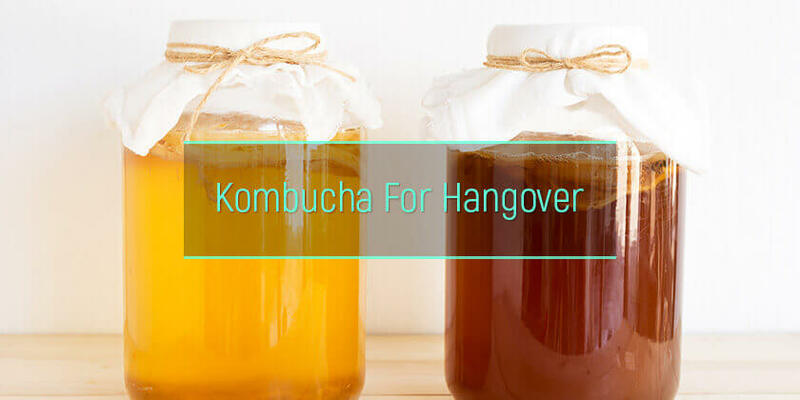 Even though many people have suggested kombucha as one of the best homemade hangover remedies, there is a couple of concerns that patients should note before they opt for a kombucha hangover cure. First of all, kombucha is slightly alcoholic – this is a factor that should certainly be taken into account. There are some other potential side-effects associated with the use of kombucha. For example, when drinking too much of this beverage, a person may experience digestive distress, along with bloating. Some drinks also contain a lot of added sugars. Since the drink may stimulate a person’s appetite, there is also a chance of consuming too many calories. Another concern would be contamination, which can occur when problems develop during the fermentation process. These side effects may include nausea and vomiting, head pain, yeast infections, and digestive issues. There is also a possible risk of allergy that should be noted. There have also been cases of kombucha contamination with dangerous fungus and bacterial microorganisms. As one of the recommended natural hangover remedies, many people have tried kombucha after waking up with a headache, nausea, and other issues the next day. The question that remains is will kombucha help a hangover. [mesasge type=”info”]One scientific paper explains that many health benefits have been associated with kombucha, but there is too little scientific evidence to back up these claims. [/message] Thus, this fermented beverage may not be the ideal option for people looking to find an answer to a question like what to drink when hungover. Due to insufficient evidence, the potential side-effects that may occur with the use of kombucha may outweigh the possible benefits. When relying on kombucha as a hangover cure, it means the patient is going to drink alcohol to relieve a hangover. Kombucha has been associated with a couple of potential health benefits. The drink may assist in hydrating the body and detoxification. With certain added ingredients, nausea and other symptoms may also be relieved. Unfortunately, without enough scientific evidence, this is not the most appropriate option for patients looking for a hangover cure, as well as N-Acetylcysteine supplement. The programs for alcoholism recovery are the best way to treat and prevent the possible effects of excessive alcohol consumption, including hangover. The wide range of the alcoholism rehabilitation options offers many solutions to address the problem. AlcoRehab » Hangover Symptoms, Causes, And Side Effects » How To Cure A Hangover: Best Veisalgia Remedies » Kombucha For Hangover: Is Fermented Tea Good For Veisalgia?